The G8 meeting of foreign ministers in London on April 11 proved unable to settle some of the most disputed issues on the agenda, the discussion of which is now delayed until the June summit of country leaders. While foreign ministers agreed on drug trafficking, arms proliferation and terrorism, they continue to be at odds on Korea, Syria and Israel. 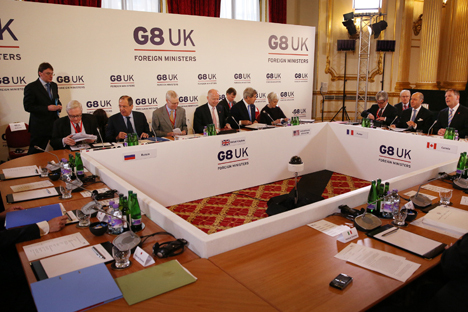 The official meeting of G8 foreign ministers in London on April 11 decided the agenda for the G-8 leaders’ meeting in June. Only a few topics proposed by Britain, which is chairing the G8, raise no objections on Russia’s part. The ministers are unlikely to come up with as much as a single paragraph of approved text on the more acute issues – above all Syria. The meeting is a key stage in the preparations for the G8 summit to be held at Lough Erne, Northern Ireland, on June 17–18. There are few topics on which the G8 foreign ministers see eye-to-eye: drugs, international terrorism, proliferation of WMD and conventional arms smuggling. Another uncontroversial topic proposed by Britain, which holds the G8 presidency, is adoption of a document on prevention of sexual violence during armed conflicts. According to a Russian diplomatic source, the British want the joint communiqué to include a separate item devoted to Syria. “But that is hardly realistic considering the existing differences,” said the source. The diplomat noted that Russia was trying to get the conflicting parties to the negotiating table in accordance with the Geneva communiqué adopted last June; meanwhile, Britain, France and the U.S., which have also signed the document, are bypassing it by arming the Syrian opposition and encouraging it to continue the fight against Bashar Assad’s regime. A source at the British Foreign Office has also admitted that a meeting of minds on the Syrian issue at the G8 summit is unlikely. Thus, a few agreed upon sentences regarding the conflict’s humanitarian dimension would be considered an achievement. The positions taken over the aggravated situation on the Korean Peninsula will not be easy to agree on either. While all the foreign ministers have been talking tough on Pyongyang’s actions, they differ on the details. The Russian Foreign Ministry said Moscow “is categorically against the actions of North Korea being used as a pretext for a massive build-up of military presence in the region, pumping arms in there, deploying missile defenses and other actions going beyond neutralizing the real threat coming from the DPRK nuclear missile programs.” The threat of increased military presence in the region comes from the U.S. and its allies, Russia believes. The ministers also differ on talks about Iran’s nuclear program. John Kerry thinks lack of progress at the recent meeting of the six international mediators and Iran is due to Teheran “stalling” and continuing to improve its nuclear technologies. There are major differences among the G-8 countries on cybersecurity, as well – another topic being played up by London. Although all the leading powers speak of the need to adopt a code of conduct on the worldwide web, they have different ideas as to what the rules should be. Russia feels that the West is progressively militarizing cyberspace, while the West claims that Russia is seeking to bring the Internet under state control. First published in Russian in Kommersant.